You can get a head start on spring and save the cost of starter plants by starting flower and vegetable seed indoors. Inexpensive seed packets for every imaginable plant are usually available year-round at your local garden center and certainly on the internet. If you are growing vegetables, keep in mind that seedlings will be ready to go out in the ground about 4 to 6 weeks after germination. Once planted out, if there is a frost, they will be killed off and all your time and efforts will be wasted. Therefore, time your vegetable seed planting with that in mind. To successfully produce sturdy seedlings indoors, you will need to give them proper temperature and light conditions. Indoor lighting, even in an enclosed porch, is not strong enough. The preferred method for growing plants indoors is to use grow lamps - but ordinary flourescents will suffice for the short period necessary to get your seedlings started. You can set up an adequate growing area that won't take up much room in your garage or basement by using building blocks and boards to create simple shelves. Make arrangements to suspend one or more flourescent light units about two to three feet over the shelves. Keep the lights on at least 12 hours a day. Now comes the fun part. 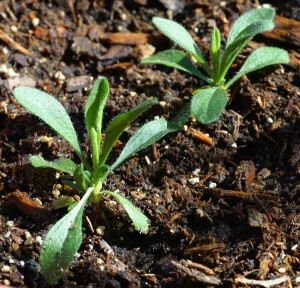 Give your plants a jumpstart by using a good seedling mix instead of plain dirt from your garden. Use flats or other containers that are at least 2 inches deep such as plant trays, small pots or plastic containers with holes in the bottom or jiffy pots. Don't use egg cartons, they are not deep enough. Fill your containers to the top and moisten slightly to let the mix settle, then plant your seed in accordance with package instructions. Keep mix on the moist side until sprouts appear. The heat from the lamps should be enough to encourage germination, but temperatures should not fall below 50 degrees at night. Once your seedlings are up and growing with 2 pair of true leaves, you can give them some water soluble plant food at half strength once a week. Now is also a good time to start using a small fan to provide air circulation which will envigorate the little plants and help prevent dampoff and other fungus diseases. If you are growing vegetables, you probably won't need to do anything but keep them watered and fertilized, but if you are growing ornamentals and depending on the plant, you may want to pinch out tops to create bushier specimens. About two weeks before your seedlings are ready to be put out in the garden, harden them off by placing the containers outside in a sheltered area during the day. This will get them accustomed to outdoor conditions which will help the transition when they are finally planted in your backyard garden.